In her own words, Kate Rusby is a nattery sort of lass. The previous two postings at Salut! Live perhaps prove she has got herself bang to rights with that phrase. I hope you agree with me that her answers to my questions offered a warm and revealing insight into the life of a woman who has done so much to make folk music entertaining without ever threatening to diminish its integrity. But amid all that natteriness - a word she used, the first time we ever met, to sum up what she loved about her fellow Tykes - it is still possible to pin Kate down to short and sweet answers. 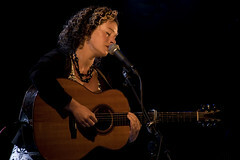 Read on and you will learn a little more about her from a quickfire Q&A session that I decided to bolt on - a bonus track, as it were - to my article for her own website (it was not yet live there, but is now; follow this link and you may read Kate Rusby on the "rare diamond" that is folk). OK pupil. Good when I fancied, so I suppose that makes me bad! If you had one wish…..
* Earlier in this series, you can read more about Kate Rusby's "dodgy taste in pop music" and having to prove she's old enough to drink. ** Because I had agreed to write for Kate's site, I thought it appropriate - as I did with The Girl Who Couldn't Fly - to declare an interest and decline to review Awkward Annie for the Daily Telegraph. It would have been a rave review, since I honestly believe it is a great album, but readers would have been entitled to detect a conflict of interest. So the DT gave the record to Helen Brown to review. Helen is a very good writer, but she and I often reach different conclusions on the same records (proving yet again, as I keep saying, that reviewers are essentially just fans with platforms). Anyway, guess what - she loved it, too. You can get Awkward Annie here for under - if only just - £9, but you'll need to add another album to your order if you want it postage free. Hi Colin, many thanks for this interview. Kate has a new fan, I've just spent the past half hour listening to clips on her site and YouTube. Think I'll have to pick up her new CD in the next few days. I think it's her best album for a long time. I love the way she is working with brass bands and her own songs are developing well. I was worried about Village Green because I think it is such a great song and so Ray Davies. Would Kate be sardonic enough to carry it off? She puts a different take on it and it is an outstanding track. Keep pushing the boundaries Kate, there's a lot of great music out there for you to work on.